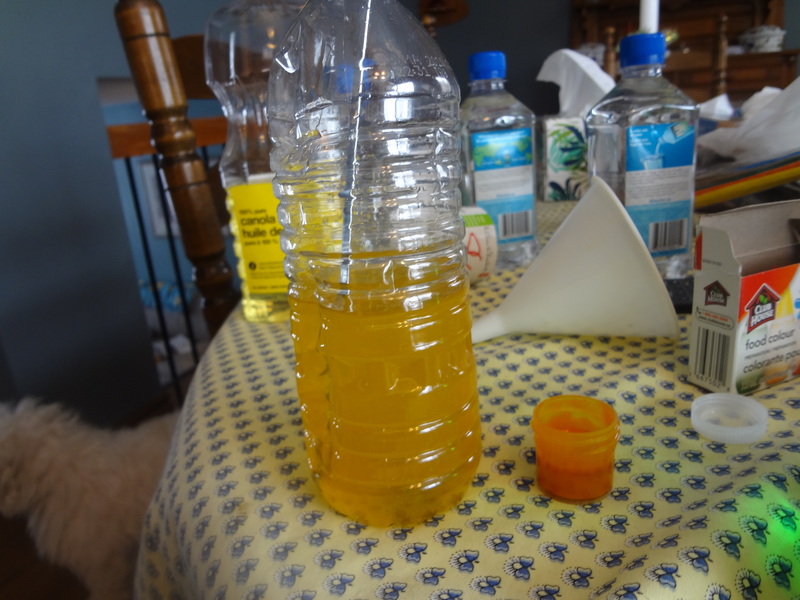 In a separate bottle pour in some of the oil of your choice ( Since canola is already a faint yellow it is easy to make yellow based colours.) 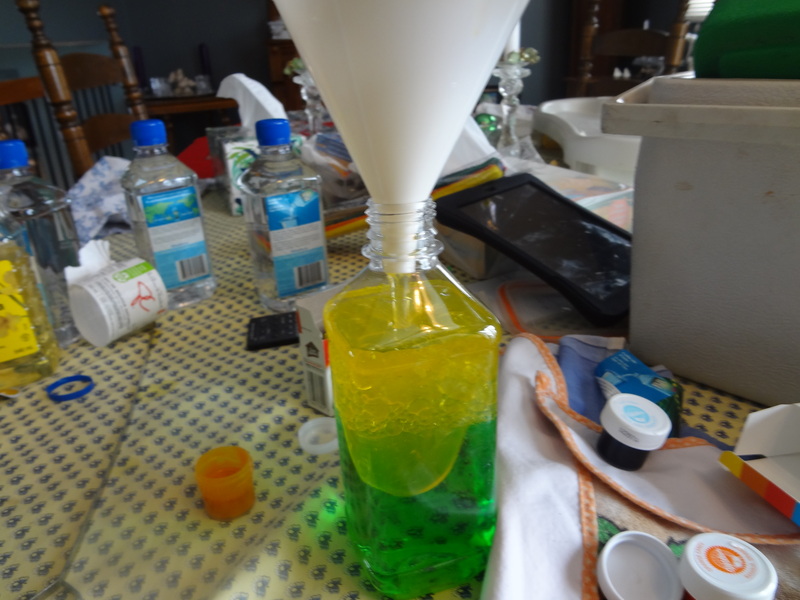 and add some of the oil based food colouring. At first I tried using a pipe cleaner to stir it in but this was unsuccessful and I ended up using a stick. 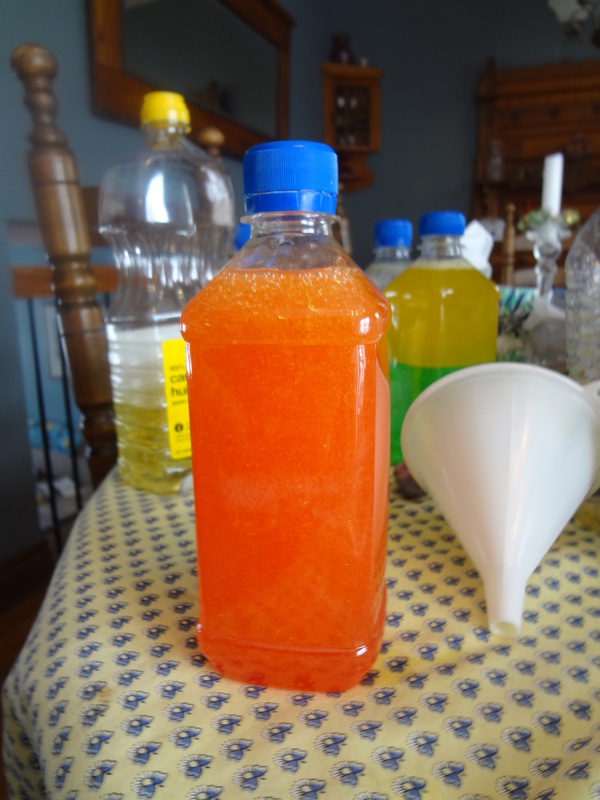 Honestly looking back all the oil based food colouring really did was end up deepening the yellow and if you don’t mind a bit less vibrant of a yellow and you used canola oil you may not even need the colouring. (If you try this let me know how it works out!) 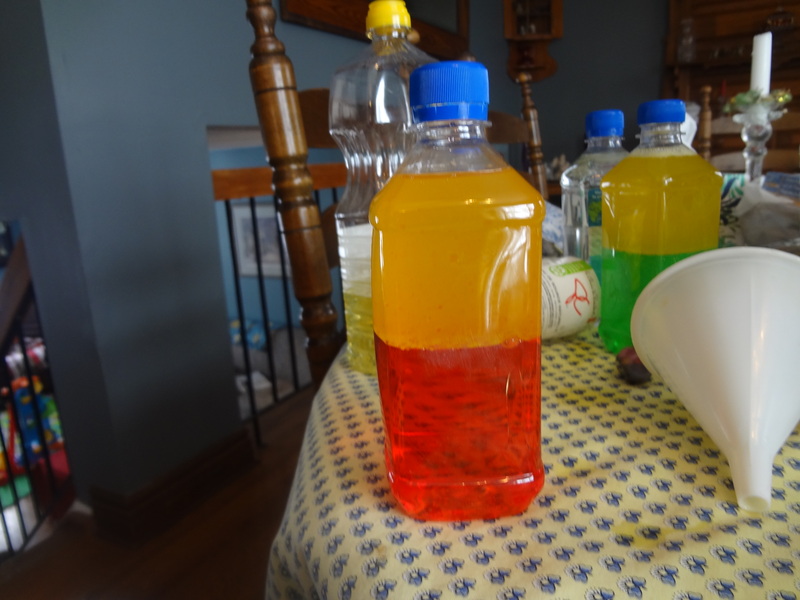 If you plan on colouring the oil other colours however you will need the dye. 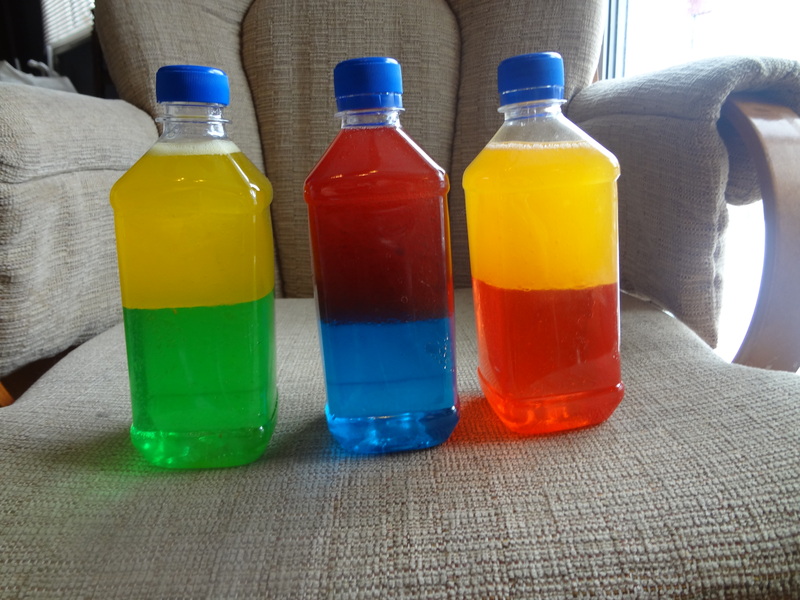 Using a funnel (or if your feeling brave just go for it) pour your oil into the water bottle holding your water, it will look pretty cool and eventually separate into two clearly defined colours. I ended up doing the pouring since Gray has somehow developed some deep animosity for the funnel and throws it across the room anytime it gets close to him. Make sure once you finish you hot glue or tape the lids on so busy hands can’t twist them off. Give it a good shake and you get this! 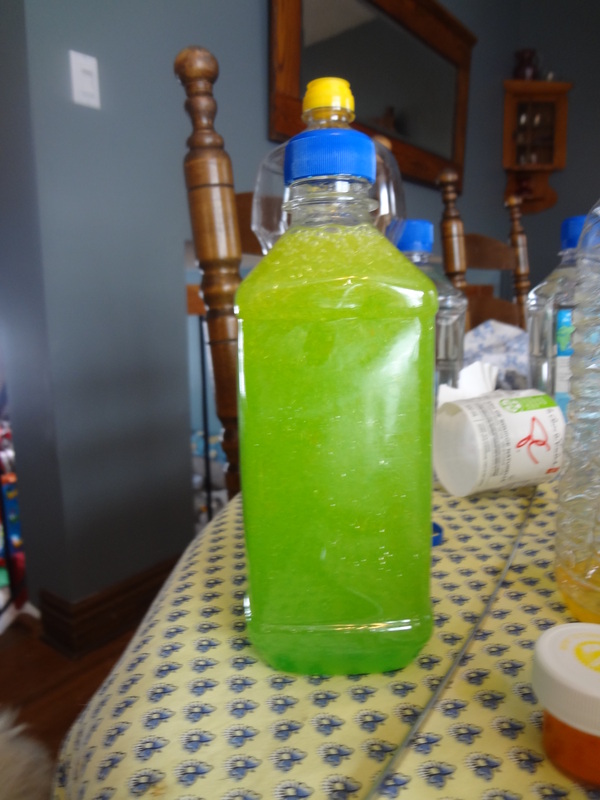 After our ‘green’ bottle we made this one. Which once shaken looks like this. Gray insisted on making our next one with red and blue which look rather pretty but once shaken just makes a sort of murky brown purple. 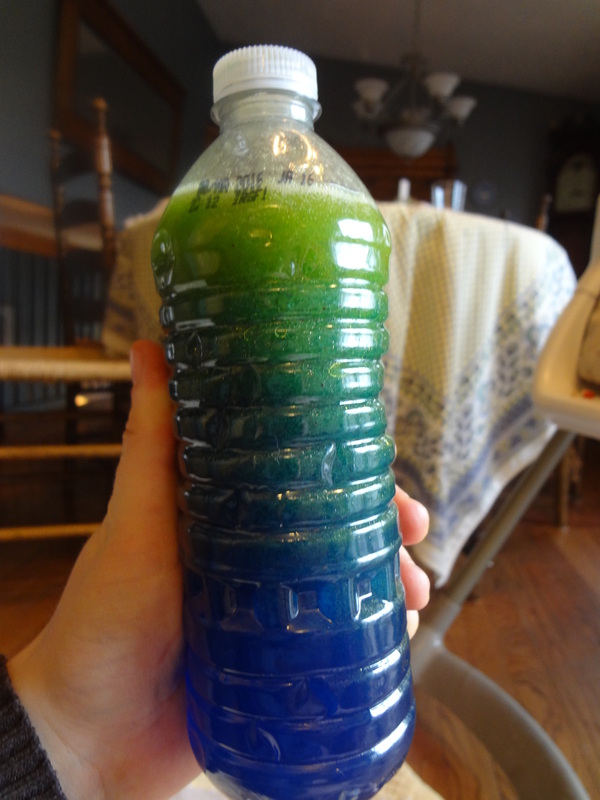 I also thought we would try one made with olive oil which is green instead of yellow and we coloured the water blue which turned out this. 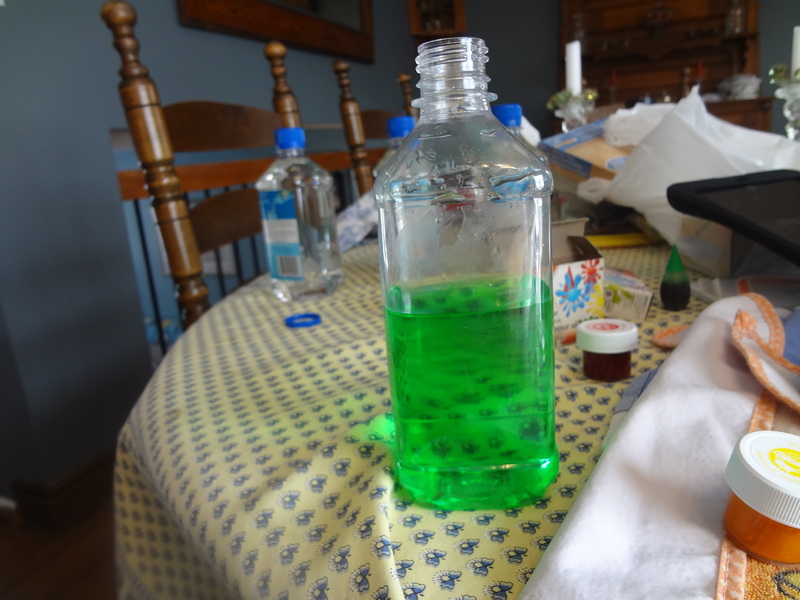 Once again I would like to stress the importance of gluing the lid on, especially if you plan on putting fun little objects into your bottles like glitter or beads. All in all it was a lot of fun and when he gets a bit older it can help teach him how mixing two colours together can make a whole new colour, but for now they are more of a visual attraction to him than anything, which is fine by me! We hope you enjoyed this post and feel free to ask any questions or share your ideas, we hope you will join us again at Excite and Explore! 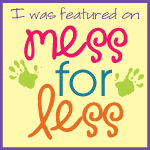 Categories: Fun at Home, Science Anyone? 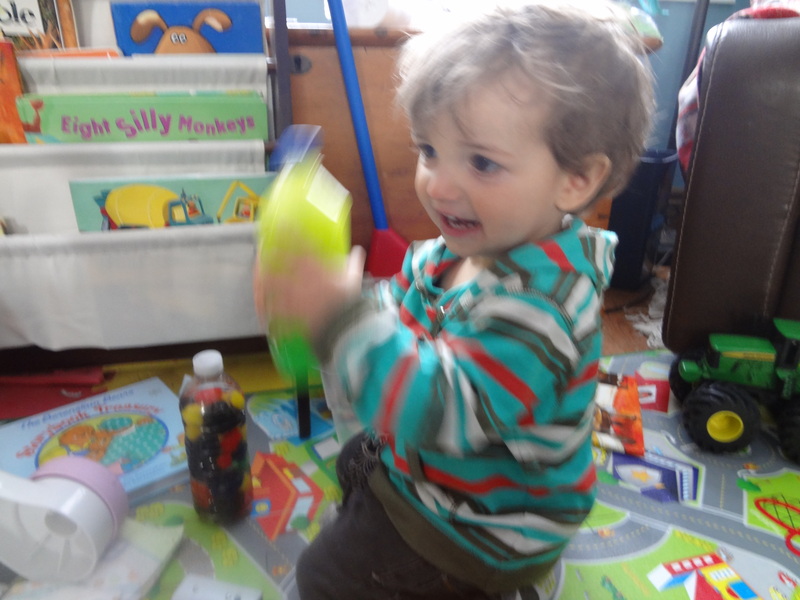 | Tags: Activity, Colour Mixing, Science, Toddler | Permalink.